Christmas is a time for sharing family traditions and customs. 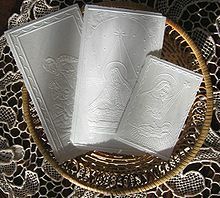 A popular Polish tradition is the sharing of the Oplatek. During this custom Family members and friends break off a small piece of the opłatek wafer and give it to one another along with a blessing. Breaking off and exchanging part of opłatek with someone is symbol of forgiveness between two people and is meant to remind participants of the importance of Christmas, God, and family. This entry was posted in Blog and tagged christmas, communion, oplatek, polish tradition on December 16, 2010 by Sikorski Meat Market.